Size: It reaches a maximum length of 6.5 cm. 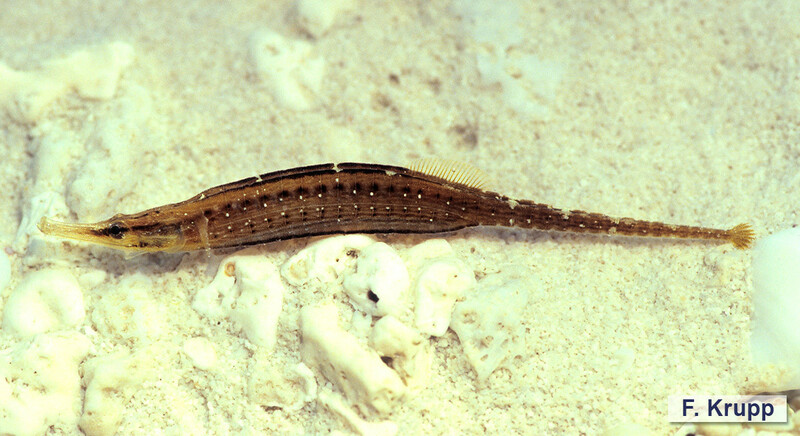 The Shortbodied Pipefish is a cryptic species that occurs inshore and at islands in coral areas, among coral rubble, in seagrass beds, and in tide pools. It feeds on small crustaceans. During reproduction, females transfer their eggs to the male’s brood pouch beneath the tail. Males brood the eggs until they hatch and then give birth to the young. The species is widely distributed in the tropical Indo-Pacific, from the Red Sea and East Africa to the Society Islands, north to the Philippines and Guam, south to Australia. In the IUCN Red List of Threatened Species global assessment it has been classified as Least Concern (LC); in the Arabian Gulf regional assessment it is listed as Data Deficient (DD). It has no importance to fisheries. A small species of pipefish, characterized by continuous superior trunk and tail ridges, and the lateral trunk ridge being confluent with inferior tail ridge. Its color is light to dark brown, usually with two parallel rows of small black spots along the trunk and white flecks on trunk and tail. A dark stripe from the side of the snout passes through the eye to the opercle.